So today… I cleaned my room, cooked, cleaned part of the house (yay for the vacuum cleaner…) and checked for my grades (again!). I’ve only gotten 2 of 4 of my grades in so far. I’m still waiting on math (the big nailbiter) and my plants biology class. I also got the grade for my paper for my plants biology class – A+ on my paper about global warming and how it concerns polar bears (yeah, I know, I wrote about polar bears for my plants class paper). Weirdly enough, my school has a grading standard where A+ is not the same as 100%, but I’ll take it nonetheless! 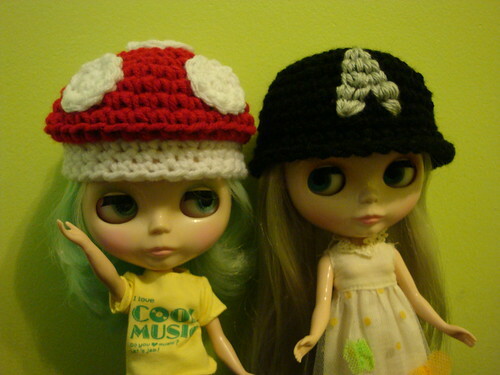 On the left is Tertiary Jane (wearing a Mario mushroom hat) and on the right is Sophie, wearing a black beanie with the Star Trek logo (yay, for internet for letting me know what the logo looks like).